Home Facebook Facts Facebook Tips Money Why is Facebook Share Plummeting? Why is Facebook Share Plummeting? Facebook got listed on NASDAQ and it started with a whopping $100 Billion listing creating a history. Many people including myself was critical of Facebook really getting a $100 Billion pricetag and we were highly criticized because of that. Now Facebook has started feeling the heat of getting listed and its share is plummeting each day. Now as the number stand Facebook share is at an alltime low of $19 something and facebook started of with a $100 billion price tag and now its valuation is around $ 42 Billion which is 60% less than what it was few months back. Facebook Share Fall Patter Source Google Finance. So what are the reasons why Facebook shares are going down the drain so fast? Here are some of the primary reasons. 1. Compared to Facebook price tag its revenues aren't that great. 2. The world is going mobile and Facebook has no Mobile strategy to earn revenue out of mobile business. 3. 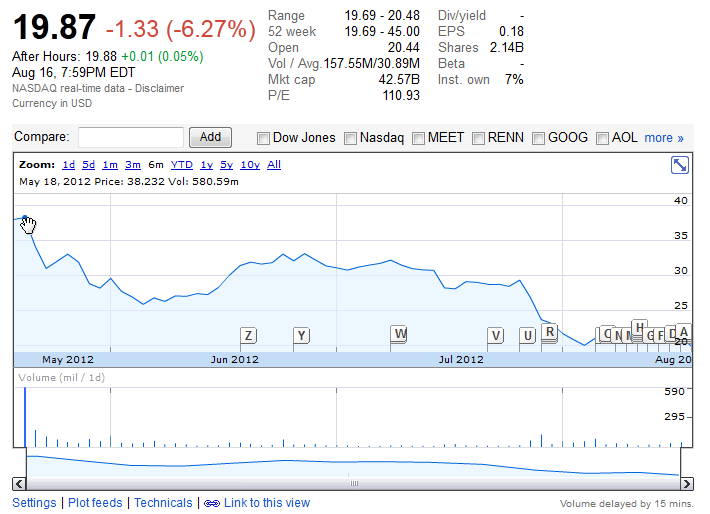 Facebook investors are very gloomy as far as Facebook's strategy to increase revenues. 4. More than 270 million shares are in open market as the lock period to sell the shares for initial investors has passed. 5. More than 1.4 billion share will be in open market by year 2012 end. All the above are some of the critical reasons but the most important is Facebook's inability to increase revenue which is a very scary thought.